ONE OF THE TWO men accused of murdering a British soldier in London repeatedly interrupted his bail hearing today to shout “I’m a soldier” and accuse the judge of stifling the truth. The video-link connecting Michael Adebolajo, 28, from prison to the Old Bailey central criminal court was eventually switched off after the judge asked him several times to be quiet. Adebolajo is accused along with another man, 22-year-old Michael Adebowale, of hacking soldier Lee Rigby to death in broad daylight near a barracks in Woolwich, south east London, two weeks ago. He is also accused of the attempted murder of two police officers and possession of a firearm. In his second appearance in court since being charged on Saturday, Adebolajo was still wearing a plaster cast on his left arm after being shot by police at the scene of the murder. He has been seen by psychiatrists five times – three times in hospital and at least twice since he was discharged on Friday – and has been declared fit for interview each time, the court heard. Defence lawyer David Gottlieb said: “It’s the prosecution’s case that he is completely sane. He doesn’t suffer from any mental disorder at all. Mr Hamza agrees with that”. 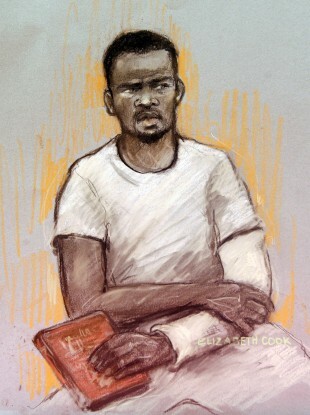 Adebolajo asked at an earlier hearing to be referred to as Mujaahid Abu Hamza. Really and truly it’s about the good, honest, decent, hardworking British members of society, whether they be Muslim or non-Muslim. They are the ones that have suffered the most. But he later praised the judge after Sweeney let him have his handcuffs removed in the video-link room at Belmarsh prison, on the understanding that two prison officers sit beside him. “That man who is wearing the white wig and the red robe. May Allah bless that man because he has had the courage to do something that many wouldn’t have had the courage to do,” he said. Adebolajo’s case will return to the Old Bailey on June 28, when it will join up with that of his co-accused, Adebowale. Email “Woolwich accused disrupts court hearings, shouting: ‘I’m a soldier’”. Feedback on “Woolwich accused disrupts court hearings, shouting: ‘I’m a soldier’”.